Nefarious sees you take on the role of Crow the villain in a 2D platformer with essentially Megaman as your main arch rival. While the whole game is nothing amazingly new there are some pretty cool things in here which make Nefarious a definite highlight of the fully loaded Switch eshop. The basic levels are pretty standard platform run and gunning type games. There is a pretty cool mechanic that halfway through each level you manage ti kidnap the princess you are hunting (for your princess powered doomsday device) and she alters the controls and gives you a brand new ability that alters the rest of the level. I am surprised that you could not the go on to replay levels with the other princesses powers to access new areas but perhaps that was what the Metroidvania game this really should have been could have done to stand out from the crowd. A real highlight fo the game, however, is the boss fights where instead of playing the sprightly hero you play the big hulking boss complete with big death rays and easily telegraphable attacks. Most of these fights are excellent and it really is something that makes the game stand out. Visually the game is very pretty and some of the more artistic sections (particularly and underwater level) are damn right gorgeous to loo at. The storyline is also very interesting and I was desperate to see where it was going to end up. I must say however the standard ending was very disappointing and I was left desperate to see the true ending which sadly didn’t massively improve the outcome. The general gameplay is a mixed bag but mostly enjoyable and I really did have a great time with Nefarious in my 4hourish playthrough. Nefarious is not perfect by any means but it is a very enjoyable game that I would definitely recommend if you are looking for a fun action platformer with a decent twist. Golf has been oddly successful on the Switch without there being a PGA game in sight. Last year Golf Story took the eshop by storm and here we are with gold puzzle game "Golf Peaks". I first played “YIIK: A Postmodern RPG” a few years ago EGX and by the end of the very short demo, I was left very excited about playing in the final release. I first played Gal Metal when it was a free to download demo on the Japanese eshop and even then, I knew this was a potentially fun title to keep my eye on. 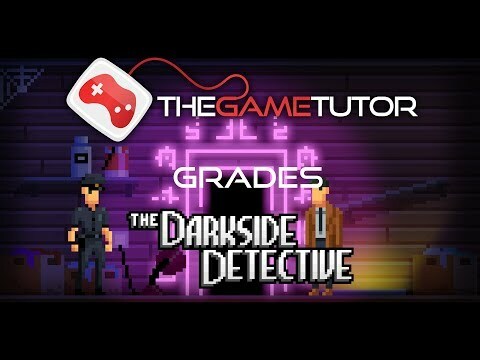 From the moment I loaded up Darkside Detective it absolutely oozes with charm. The game is a point and click adventure broken up into a selection different cases.